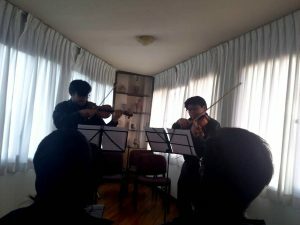 Chamber music concert by the students and members of the Youth Orchestra of the Bolivia Classic Foundation. 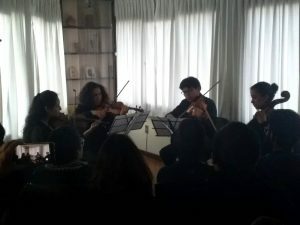 The program included the interpretation of a Saraband by Bach, several preludes and dances by the same German baroque composer, and Latin American music with the ‘Alfonsina y el mar’ Zamba in a duo version of cello and guitar. The event ended with a beautiful piece for string quartet of the Spanish classical period by composer J.C. de Arriaga and a virtuoso piece for violin Solo by the Belgian composer Charles Beriot. An unforgettable evening for the public and young musicians deeply committed to their art.